Keeping track of the ecosystems available to software developers is no mean feat. Sravish Sridhar, CEO of Kinvey, started mapping them out in his Backend As A Service Ecosystem “subway” map six months ago. And now he’s updated that map to add another category — mobile enterprise application platforms or MEAPs — to the existing Iaas, PaaS, SaaS menagerie. offer broad software platforms to support enterprises that want to enable multiple mobile apps for multiple operating systems which access multiple sources of data. 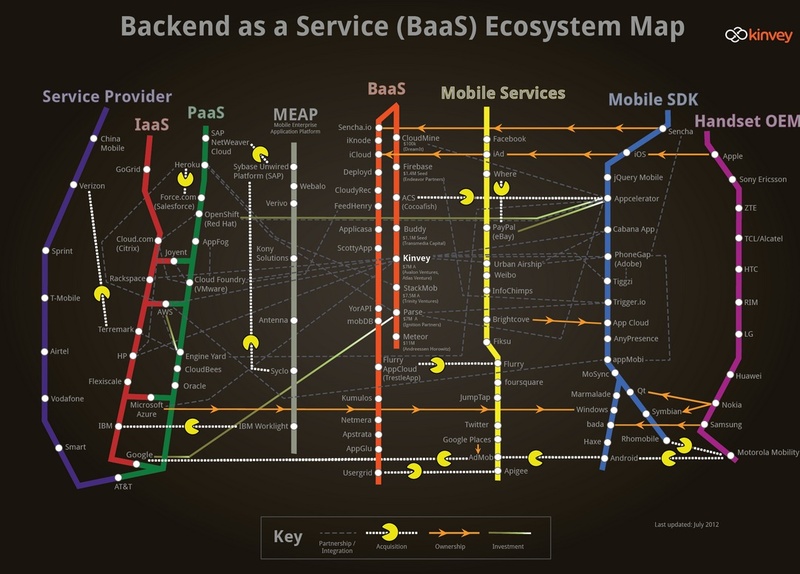 We think they belong in the Subway map of the Backend as a Service ecosystem, even though they do not offer a service, because they are a significant way enterprises address mobile infrastructure needs. Also, we see some MEAPs now working to extend their value to the large market of nimble mobile application developers. The problem is that big enterprise software companies are, well, big enterprise software companies. They want to provide big stacks of middleware and client software and integration pieces. And they want to sell this the same way they’ve always sold software — for big dough. That doesn’t fit the mindset of mobile developers who want to build stuff fast using free or near-free tools. Enterprise software vendors are starting to get that– which is why Adobe bought PhoneGap, IBM bought Worklight etc., SAP bought Syclo etc. Secondly, Kinvey, which offers its own platform to make it easier for developers to deploy apps on Microsoft(s msft) Azure, Rackspace(s rax) or Amazon(s amzn) clouds, says the mobile platform guys are moving down the stack, looking to become cloud service providers to make the money they can’t make on their free or near-free tools. Over and over again, one hears that developers don’t want to pay for development tools … Mobile SDK providers look elsewhere for revenue, including to backend cloud services. Appcelerator acquired Cocoafish and released the functionality this spring as Titanium Cloud Services. Yesterday, Flurry acquired Trestle to tack on cloud services to their mobile marketing services solutions. So, without further ado: Check out the new map with the MEAP addition.